As we reported earlier that the Online Local Search and Directory Market is Heating up, which is an emerging marketplace as confirmed by Sensis FY08 report. Today we explore one of the new entrant in this segment, Local.com.au, founded by Ron Brewster of Sydney, Australia. 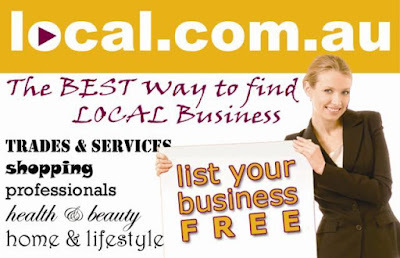 local.com.au is a directory of business and services Australia-wide. We allow free advertising for all business, including FREE links to websites. For $1 a day, business can rise to the top and can add pictures and video to listings. I believe we have the BEST directory model currently on offer in Australia. Myself primarily, but I have a very good coder and a series of consultants who I work with. We're currently looking at a minor expansion and will probably start employing within the next 6 months. I've been working on this for 10 years now, but it took about 6 months to get the software model right initially, but business back in the late '90's just weren't ready to think about "local search". I remember being told, on more than one occasion, that nobody will search for anything local on the internet. After a few false starts, I put it on the back burner until the end of 2006 when the term "local search" was starting to be talked about. We then rewrote the software totally and with a few tweaks along the way, you can now see the complete model on local.com,au ... although there are some newer technologies to be built in when the time is right. It's really only in the past 6 months that I've seen our traffic levels and direct referrals to local business are at a level where I'm now prepared to "take it out in public". To give small business a level playing field to advertise in a meaningful way online. General advertising costs are becoming prohibitive for small business and I believed there was a better model that could help this vital business segment. There are huge numbers of home-based business that are essentially hidden from sight. I see local.com.au as a means of giving them a profile in our local communities. I was a huge supporter of Google AdWords in the early days, but the rising costs are now starting to preclude smaller business unless they have deep pockets. Basic keywords now are approaching $1 a click and in one extreme example have reached $11.00 a click. I am determined to provide low, fixed-cost advertising that will allow small business an equal opportunity or online advertising. Allowing links to websites free of charge, and even linking to other local directories - local.com.au provides the best source of in-depth information for local consumers. We even allow video to be attached to paid listings, which is going to be a great tool for local business. Over 90% of our listings link directly to websites, and even those without websites are given ample space to write a decent business profile. Most directories are made up of name, address and phone numbers... For consumers seeking in-depth information they are essentially useless... local.com.au is seeking to fill this gap. Local Consumers... anyone seeking information on which to base a decision to purchase or use services. It's interesting that our traffic dips through the school holidays leading me to believe a lot of parents are using the directory. We also see this in the shift in keyword searches just before school holidays as well.... It's an interesting dynamic. We are also focusing very much on Local Business - any local business wanting to be exposed to our traffic. We currently have just under 4,000 registered business, most with the Sydney and NSW Country regions. We're experiencing strong traffic increases, having doubled unique visitors in the first half of this year (2008), but based on current figures, we're getting over 30,000 unique visitors a month and making over 50,000 referrals to listed businesses websites. I am hopeful that over the next 12 months we can make over 1 million referrals to local websites, and gain over 750,000 unique visitors. At this stage nearly all our traffic is based on organic search terms within search engines, and Google is providing us with over 70% of our total traffic. We do no advertising, and have very few links back to the directory. Obviously as we start gaining more paid listings we will use these funds to raise public awareness.. this will help increase our traffic which in turn will help drive sales of paid advertising. My only benchmark is the ratio of referrals back to registered websites. Obviously we monitor traffic, but unless we are providing a direct benefit to registered business, then we're missing the point. I remember reading a keynote speech about directories. A phrase that has stuck with me was a reference to directories talking up the benefits but failing to deliver. I've read in the past few weeks where both Yellow Pages & True Local are claiming traffic levels that sound impressive but are only just equal to the number of businesses they have listed... the equivalent of one visitor a month for each businesses listing. Ha... I think all directories are struggling with this to some degree. We are starting to actively sell Premium Display Listings to business sectors we know are gaining benefit, but it our desire that business will see the benefits and sign themselves. We have considered Google AdSence, but at this stage I am not convinced it will provide the best long-term solution. It would be preferable, in my opinion, to have our own dedicated advertisers who we know will provide a better fit with the directory. It would be a great advantage to be able to partner with a larger organisation to assist with generating a profile, and sales, but at this stage of the many approaches we've had, most are only interested in acquiring the domain name cheaply. Umm... Yellow Pages, True Local, HotFrog, DLook are all providing similar services, but I feel local.com.au is offering a better choice. While there are a significant number of directories, I can see most have followed the Yellow Pages model of name, address, phone number. Those that are providing a directory similar to local.com.au are either restricted geographically or appear to be out-of-date. I would like to think that local.com.au could become one of the stronger directories within 3-5 years... we certainly have the name, and the potential. As an example, I can't have someone change a washer in a tap without them being regulated and licensed. But a 16 year old with no business skills can setup a website and deal with the professional image of a company and it's communications. They can setup online transactions dealing with credit card information. We've all got our horror stories of seeing shocking websites produced at extraordinary prices, or designers ordering domain names in their own names and in some cases high-jacking them. I have literally seen the exact same services being offered at $50 that some other companies are charging over $2,000 - if anything were to be don, I think a rethink of how we can protect the 80% of business that now deal with the internet would be a good start. We're an isolated and insular industry.. too many late nights thumping at keyboards, drinking coffee and ruining our health. Traditionally many in the industry have jealously guarded their ventures, but I'm starting to see a shift as the cream rises to the top. There is starting to be a real openness in some circles. I try to read a lot of forums and blogs, and am starting to talk with similar ventures .. it's always interesting to hear how others are struggling with similar issues. Thanks Ron for sharing your thoughts with us. All the best for future. Local.com.au is an awesome online directory. I received lot of customer because of my advertisement with them. One more thing the agents are very professionals.